Lenovo has customers across 160 countries and 54 000 employees from 60 different countries around the world who speak in 100 different languages. According to the data, top 100 Lenovo’s executives represent 20 nationalities. Lenovo supports the UK Tech Talent Charter, which commits to adopting inclusive recruitment processes and goals for women on interview shortlists, ensuring that employment policies and practises support the development and retention of an inclusive and diverse workforce. In 2017/2018 Lenovo produced its first diversity and inclusion report. Company conducted a global survey of 5.000 people in 5 countries – China, the U.S., the UK, Germany and Brazil. These countries were chosen because they reflect 70% of Lenovo’s workforce. Participants were of varied age, gender and cultural backgrounds. – 83% of Lenovo employees reported that Lenovo has created an environment where people of diverse backgrounds can succeed. – 87% said all employees are treated equally and fairly regardless of gender, age, race, disability, religion, or sexual orientation. – 89% said they are treated with respect at Lenovo. Managers are encouraged to seek out diverse candidates and there is a specific DISC assessment to better learn about people’s behavioural styles within manager training. Lenovo has 2 leadership development programs- Global Women’s Leadership Development Program (WLDP) and U.S. Mosaic Leadership Development Program (MLDP) which are aimed at developing high potential talent for the executive ranks. Programs welcome women, ethnic minorities, disabled people, LGBT, two or more races, veterans. 2. Foster diverse + inclusive systems. In the past Lenovo has placed several women in key positions – Chief Legal Officer, Chief Marketing Officer, Chief HR Officer and Vice President of Strategy. In key locations, 86% of the company’s management is of the local nationality. To attract the most diverse and qualified candidates, Lenovo ensures that messaging in their job descriptions reflects their culture and values. Additionally, they are piloting an artificial intelligence (AI) tool that analyses job descriptions and suggests changes to helps them appeal to female and under-represented candidates. It helps provide a gender-neutral job title and description, a simpler understanding of the core competencies of technical positions, the information on day-to-day activities, and compensation. To reinforce their commitment to equal employment opportunity in the recruitment process, they implemented unconscious bias and difficult conversation training for recruiters in the U.S. beginning in 2017. They will be expanding this program globally through 2019. Lenovo also targets the best students (mostly technical majors) from the top universities in Asia Pacific, China, EMEA, LATAM, and NA who have the potential to fast track to leadership. Currently, 44 employees, from 10 countries are participating in the five-year program based in five different countries: the U.S., China, Italy, England, and Japan. 48% participated in Lenovo’s Women’s Leadership Development Program and received promotions afterwards. The Mosaic Leadership Development Program resulted in 2.9% increase in African-American and Hispanic executives in the first year. In 4 years they managed to produce 30% increase in global female executive representation. In the Accelerated Sales Rotational Program for recent U.S. university graduates, there was 40% combined average of female and underrepresented race/ethnicities. 18.2 % of executives are represented by women. From Lenovo’s 11-member Board of Directors responsible for overseeing the company’s strategy and supervising its actions only one woman. Top 14 leaders include 3 women and represent nine different nationalities. Globally 35 % of Lenovo’s workforce is women. China holds the highest percentage of women employees (41%). In China each year Lenovo holds a hiring event for individuals with disabilities with on-site recruiting and interviews. In the U.S., to increase the flow of diverse applicants, Lenovo posts all positions to our website, LenovoCareers.com, GlassDoor.com, LinkedIn. com, joinhandshake.com, Americas Job Exchange, and more than 50 diversity-focused sites. They also do job postings that target veteran and military populations. We participate in Enable Americas Job Seekers Workshops, Veteran Career Mentoring Days and Career Fairs, providing information about job opportunities, training on resume writing, job searching, and interview preparation. To further reach diverse candidates, their University Hiring programs target five historically black colleges and universities annually. Lenovo provided 50 000 devices to under-resourced high school students through its foundation (Lenovo Foundation). Organisation has donated $5.3M to communities around the world in one year. Women in Lenovo Leadership (WILL): Provides networking and development opportunities globally across 40 countries. Diversitas: Provides training, networking, and career development in Bratislava, Slovakia for individuals with disabilities, LGBTQ, women, and early career employees. New and Expectant Mothers Outreach (NEMO): Provides information, coaching, and support for expectant and new mothers in the U.S.
Black Leaders Achieving Success in Technology (BLAST): Provides mentorship, leadership development, networking, and community service in the U.S. – serves more than 300 African-American employees across North America. It provides regular career development opportunities, including its six-month “Empower” mentor program, where all participating employees across all band-levels can take part in 1:1 mentor sessions on presentation skills, branding, and leadership training. BLAST also regularly hosts internal executives and external guest speaker panels for best practices insights, features a monthly recognition program for significant member achievements and promotions, and partners with other ERGs to give back to the community through the Lenovo Foundation. Hispanics of Lenovo Association (HOLA): Provides training, networking, and career development in North America. In 2020 Lenovo plans to announce an inclusivity quotient as a way of measuring various factors that are most important to defining inclusiveness of technology. 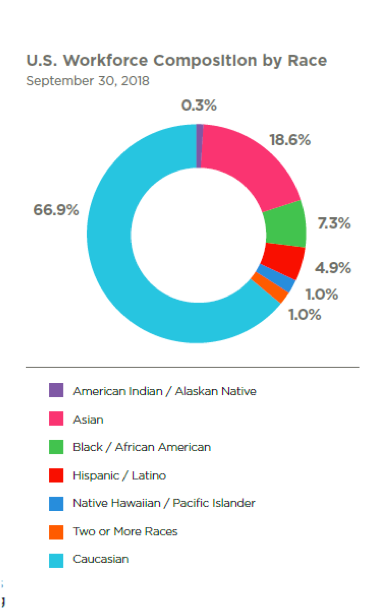 By 2020 they intend to achieve 28% U.S., Asian, Black, Hispanic, Native American, Two or More race or/and Hawaiian and Pacific Islander representation up from current representation at 26.5%.